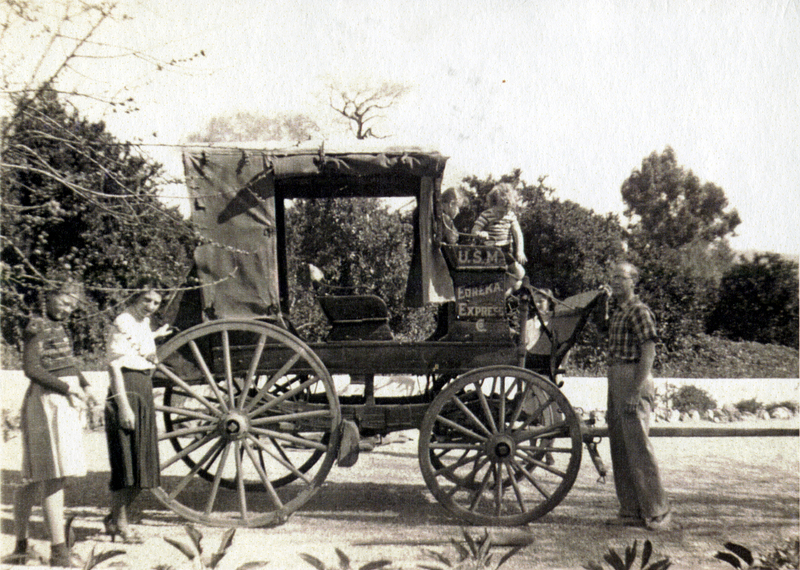 April 23, 1938 — Rübel family with their buggy at Rancho Camulos. From left: Unknown; Mary Rübel (mom); Nathalie ("Boo") and Shirley ("Pete") in driver's seat; August Rübel (dad). According to Nathalie Rübel Trefzger (interview 11-26-2013), the stagecoach was left behind by the Del Valle family when her parents, August and Mary Rübel, purchased Rancho Camulos from the Del Valles in about 1924. Nathalie and Shirley (two of the Rübels' five surviving children) said they enjoyed riding around the ranch in the stagecoach as children. They said it was sometimes pulled by horses but usually by a tractor. They also were allowed to ride horses around the ranch when they were little. The Del Valle Buggy at Rancho Camulos was manufactured about 1850 by Miller & Stevens of 368 Broadway (below Canal Street) in New York City. It made the trip around Cape Horn when it was ordered by the family of Ygnacio del Valle, who had inherited the 48,000-acre Rancho San Francisco (western Santa Clarita Valley) and built their main, extant adobe home on the westernmost section in 1853. The buggy remained behind in 1924 when the remainder of the Del Valle ranch — Rancho Camulos — was sold to August Rubel, whose daughters have said they remember riding around in it on the property. NT1021: 19200 dpi jpeg from 5x7 color photocopy | Nathalie (Rübel) Trefzger collection.